It's been some time since my last post! I've been working on some personal things (looking for a full-time sales job, and also creating a sleep/lounge/sweats line that I will show you soon!) and have just recently been so bursting with inspiration for the blog. I've also been wrestling with how I want to create and deliver content, because there is no right way to do things, you know? One thing that has been really fun for me is doing these food roundups at the end of the month. Because I'm such a foodie, and I'm always learning new recipes and new things about food, I enjoy doing a summary so I can take you along on that journey with me. I hope you like this second installment of food roundups. Hoppin' John is a southern new year's dish, thought to bring luck and prosperity, so I thought I'd start 2018 on a positive and delicious note by finally trying this dish, which I found on Isa Chandra's website (linked above). This recipe is worth it for the sauce alone, but the entire dish is so healthy and tasty, you'll definitely want to make the whole thing. My non-vegan housemates even said they wanted to make it once a week, and they haven't, so it's time for me to give them a little nudge. 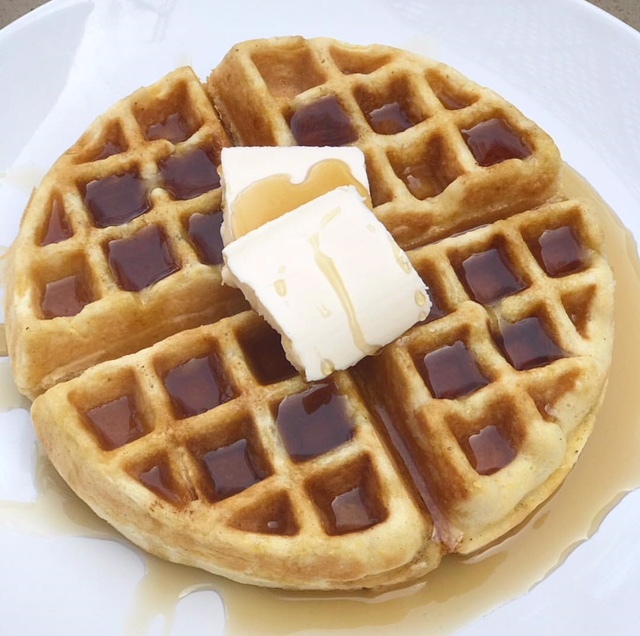 These waffles are from the book "Vegan Diner" by Julie Hasson. I was hoping to have a more orange-y or cornbread-y taste with this one, but it just tasted like plain, delicious waffles. Nevertheless, a good recipe! The cornbread recipe from this book is perfect and is my go-to, so I will continue to try other recipes from here. 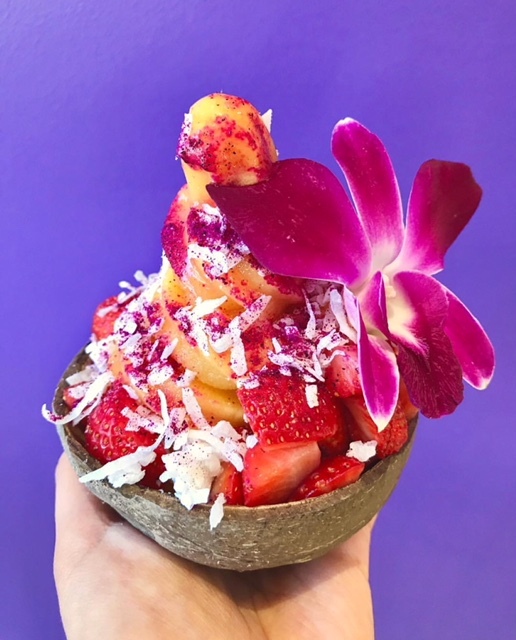 Sure, this is a January roundup, but with our 80+ degree heat wave, and Frozen Fruit Co. offering a new special in a coconut bowl, this is something perfect for the LA lifestyle. The best part about their ice cream? It is entirely made of fruit- no sugar added! So you can feel good about this, too. I loved the pina colada flavor, but ended up getting the passionfruit flavor, with strawberry, coconut flakes, and pitaya powder. The pitaya powder is that purple stuff- isn't that interesting, and great for making food pretty? I thought this was such a great idea, and would be great in applications to color food purple. You get to bring the coconut bowl home, btw. Locali does not disappoint. 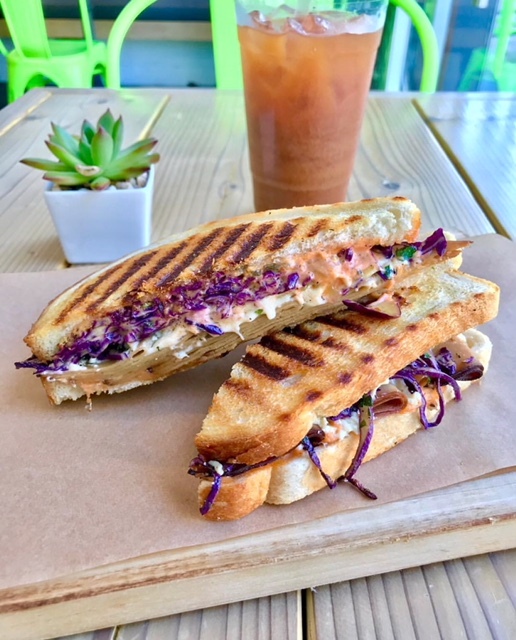 This Georgia Blonde sandwich (made vegan) has vegan turkey, swiss, red cabbage slaw, thousand island, creamy dill dressing, and stone ground mustard, on sourdough. Be sure to specify vegan, since they do use animal meat. While this was beautiful and delicious, I think it's my least favorite thing I've gotten here (which is saying a lot, because this was really delicious!) I'd be more likely to check out the rest of the menu, or get repeats of some things I loved, like the Reuben, breakfast sandwich, and/or the sweet potato chili (Reuben and sweet potato chili combination is just perfect). I could eat here like this every day! Oh, and it's across the street from a really cute coffee shop, Smith + Tait, which I'll talk about next. Hope you enjoyed seeing some of my recent foodie adventures... what new recipes or restaurants have you discovered lately?